Craft and sewing project ideas. How to projects and free patterns. I have been a crafter for many years and have accomplished many different types of projects. I am in the process of writing about and sharing these projects. Below is a list of pages that explain the project, offers tips or free patterns. I hope you enjoy taking a look at my projects and maybe find something new that you would like to try. I have several more pages to finish up and will be posting them here. I built a dollhouse made from plastic canvas that is about four feet wide and tall. Now that was a project! I learned to design my own patterns in plastic canvas and created a set that includes a rodeo arena, placemats, tissue box covers and other pieces. You can get the free printable patterns if you would like to make these. Make your own party decorations with these ideas and free printables. Blue jean purses are also one of my favorite things to make for myself, give as gifts or even sell a few. I have tackled a 36 in wide set of steer horns while painting a scene on to the skull. Here are a couple examples of other cow skulls that I painted. 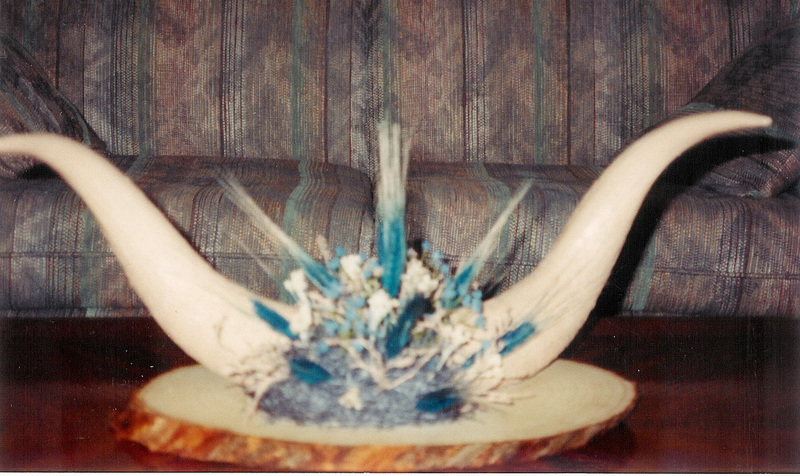 I used some horns to make centerpieces or other decorative items. Turning my family photos into coloring book pages for free distribution preserved memories that can be shared forever. My main focus lately is digital crafting. Crafting taken to the next level. I can create my own designs, have it printed to fabric and ribbon and papers to use in my projects. I also make my designs available through print on demand companies who produce designs on a variety of products for sale to the public. Dance, Party and Music Themed Fabrics. Well, this is the short list of some of my crafting experience. I hope you will stop back by sometime. I plan to have more project ideas up soon.